With so many fests coming up, one wonders what are the new trends to follow and what are the fashion no-nos. 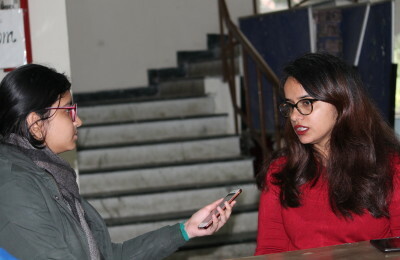 Fests are an essential part of college life, especially in University of Delhi where the season starts in the month of February and goes on till April. Some of the most iconic fests- Hindu College’s Mecca, Sri Venkateswara College’s Nexus, Miranda House’s Tempest, and many more are events that every DU kid looks forward to. In the freezing winters our options of what-to-wear seem less than the what-not-to-wear. And with Instagram setting high standards, are the ‘winter looks’ something an average student can recreate? The first look is a chic outfit which can make you look fun-but-professional in a few simple steps. The model pairs a simple black tube top and a classic plaid bottom with a bright white blazer. Another glam look is the black casual tee with black jeans paired with a contrasting turquoise blue blazer. These contrasting blazers add an extra oomph to your usual look making you fest ready! This look can never go out of style! You can wear a solid grey, over-sized sweater and accessorise it with a black, knitted visor cap. With so many fests lined up, planning outfits every weekend can get hectic, this look is super cute and comfy! Adding bold red lipstick helps you turn on the glam, effortlessly. Why should winters come in the way of your quest to pull off the perfect fest look? Here are three ways to slay, the right way! First is an iconic, full sleeved, dark red winter dress partnered with a grey leather jacket. Second is a winter classic olive green colored, full sleeve dress paired with a fur jacket which adds to the wholesome look. Complete the look with your favorite thigh-high boots! Third is an oh-so-essential beige, without sleeve dress, complimented with a pastel colored coat and matching heels which will help you nail the minimalist vibe at the next fest. Here are 2 looks you can try to dazzle in denim. The first is a simple black, high neck with a denim skirt, black stockings (yes, they are in fashion!) and black knitted visor cap, super easy and cute! The second is a denim jacket and denim skirt, paired with a black bodysuit. The big hoops paired with both outfits are back in fashion and really flatter the classic denim on denim style. This look can help you rock the retro vibe. Co-ords are a trend which have created a stir and are our must-haves. The model adorns a peach co-ord, you can also accessorize this look with statement gold jewelry to get an edge and nail the Coachella vibe. This is a chic look and can set you apart from the crowd. The first outfit is a simple red, full sleeved top partnered with a short black leather skirt and thigh-high black boots. The second look is an animal print top, black leather skirt and black stockings. In the third look the model adorns a simple animal print dress. The bold black lip adds the flair to your usual leather outfit and helps you channel your inner Safiya Nygaard. The standard of fests in DU is on a high, with performances by The Local Train, Zaeden, Prateek Kuhad and many more. These outfits are classic, casual and can add fire to your usual attire, giving you more confidence to go out and slay the fest season with the perfect look!